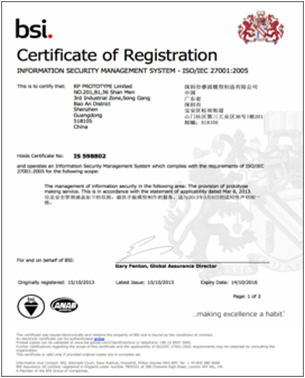 RP Group is the ONLY rapid prototyping factory in China with the ISO 27001 certification. With all the large prototyping bureaus sending their customer’s designs to the lowest bidder in China can the data be safe? The reality is very few prototyping companies around the world have any systems in place to protect your intellectual property. At RP Prototype Limited we take our customer’s confidentiality very seriously. In October 2013 we achieved our ISO 27001 and 9001 certification . ISO 27001 is a system for information/data management to enable security and traceability of data within our company. Photos Prohibited: This may seem like an obvious one for a prototyping factory but you will be surprised. Cameras including phones with cameras are strictly prohibited. Authorized Access Only: To best protect your data access is only given team members within the factory who are directly involved in your project. File Encryption: File encryption software installed on all factory workstations. Data Control System: Our system restricts the access as well as audits the movement and access to the data. We have invested in the same software as used by Foxconn (Apple supplier). Instant Messaging: Instant messaging software prohibited inside the factory. Printed Document Control: Printed 2D drawings a logged and shredded after the project is completed. IT Hardware Control: USB ports have been removed from all factory workstations. Supplier NDAs: As part of our ISO 27001 compliance we have Non-disclosure Agreement contracts with all our subcontractors.